Homeowners aren’t the only customers contemplating whether or not to cut the cord. Small business owners are also ditching their landlines and going wireless thanks to new wireless gadgets and mobile devices. If you’re still on the fence about whether or not it’s time to cut the cord in the workplace, here are five essential tips to go over before making an impulse decision. 1. Review the pros and cons. Before you make the decision to cut the cord, you should first weigh the pros and cons of cutting your landline service. Pro: Your business will save money. No surprise here. 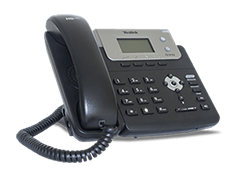 A landline with basic features can cost you between $15 and $30 per month. And that’s just for basic service. Even if you bundle your phone service with your cable or Internet, you’re still looking at an expensive bill that costs around $165 a month. There are a number of free services that allow you to make calls to anyone in the world. However, there are also VoIP services like Ooma that come equipped with features specifically designed for the small business owner. These features include everything from a virtual receptionist to conferencing, extension dialing and music-on-hold for just $19.95 a month. Business owners who rely solely on mobile devices have claimed that they sometimes experience sound quality that isn’t as clear as a landline. There’s also the possibility that calls can get dropped. And what if the power goes out? Your wireless device is useless — and so is your smartphone once the battery is dead. While this is definitely a concern, VoIP companies are working on improving their sound quality. 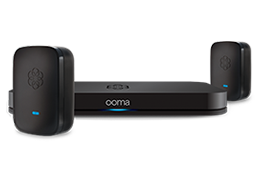 Ooma offers its patented PureVoice HD technology to deliver crystal-clear calls through your high-speed Internet. Ooma also syncs with your mobile device, so you’ll always have access to a phone no matter the circumstances. We’ll dive more into the topic later, but when you cut the cord, you are able to increase your mobility. This doesn’t just mean having phone access when you’re out of your office, but also within your home. Cutting the cord gives you this opportunity. Con: Landlines are susceptible to spam. Even if you’re on the Do Not Call Registry, telemarketers have been able to get around this. When you’re trying to prevent distractions, constantly receiving calls from telemarketers is a nuisance. Unlike landline providers, online phone companies and VoIP services have robust blacklisting capabilities that prevent spammers and robocallers from interrupting your workday. 2. Make sure you have the right “broadband” speed. For you to effectively cut the cord, you need to have the proper broadband speed. The FCC suggests that this is around 25 Mbps/3 Mbps. This probably isn’t a concern for offices located in more populated areas, but rural business owners may not have access to these broadband speeds. In fact, 55 million Americans, or about 17% of the population, lack access to advanced broadband. If you do have access to this speed but haven’t changed your plan, make sure you do so as soon as possible. 3. Select the right services. Do your homework when selecting services that can help your business cut the cord. The first service to investigate is your Internet provider. Compare prices and the broadband speed that each provider offers. Don’t settle on the first offer. And crunch the numbers if you’re offered a bundle “deal.” It may sound inexpensive initially, but as mentioned earlier, it can end up costing you more in the long run. The second service you have to consider is for your mobile devices. Again, compare limited in the features they offer, as well as sound quality. Remember, free doesn’t always mean it’s better. 4. Create a wireless office. Thankfully, there are more than enough gadgets to make sure you have everything in reach, as well as keep your office organized. The Ooma Linx allows you to wirelessly connect the phones in your office. It also comes with dedicated extensions for fax machines. The Apple AirPort Extreme Base Station is one of the fastest Wi-Fi routers available on the market. The Brother HL-L5200DW delivers fast, high-quality printing wirelessly. The Logitech Bluetooth Mouse M557 and Anker Bluetooth Ultra-Slim Keyboard are a wireless mouse and keyboard that will keep your desk free of wires. Kinivo BTH240 Bluetooth headphones can be used to block out distractions. The Roku Streaming Stick will stream all of your media, which comes in handy if you need a break from work. Amazon Echo plays music from Prime Music, Spotify, Pandora, iHeartRadio and TuneIn. You can also ask Echo questions and control other wireless gadgets through voice control. As previously mentioned, one of the greatest advantages of cutting the cord is the ability to be mobile. This means you can make or receive calls no matter where you are. Ooma, for example, offers a mobile app you can install on your smartphone so you’ll never miss an important business call when you’re not in the office. Have you cut the cord in your workplace? If so, share your experience with us in the comment section below.